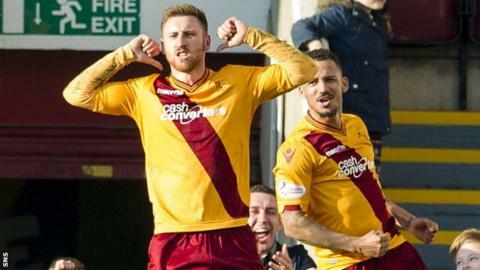 Louis Moult says Motherwell are confident they can continue their winning run up until the Scottish Premiership split. Moult, 23, scored Well's winner in Saturday's 2-1 win over Aberdeen - the Steelmen's fourth successive victory. Inverness away and Celtic at home complete the pre-split fixtures for Mark McGhee's men, who are fifth. "The passion around the club at the minute is fantastic, and the belief," said Moult. Motherwell are one of six sides bidding to join Celtic, Aberdeen and Hearts in the top six with seven points separating St Johnstone in fourth place from ninth-placed Inverness, who have a game in hand. "First half [against Aberdeen] we were poor," Moult told BBC Radio Scotland's Sportsound. "We sat off them and gave them too much respect. In the second half we made them defend and took our chances. "We were confident going into the game. I believe we can beat Inverness at their place and I believe we can beat Celtic at our place. That's the confidence we've got and the kind of form we're in." The former Stoke, Northampton, Nuneaton and Wrexham forward is enjoying life at Fir Park after having to go part-time at one point to keep his career on track. "It's been a fantastic move for myself," said the Englishman. "A massive jump up from the Conference down south. "I'm really enjoying my football, that's the main thing. When footballers are enjoying their football they play their best stuff. "I got spoon-fed at Stoke City as a kid then went part-time - working during the day, training at night, and learnt the hard way. I'll be honest, it's the best thing that's ever happened to me. It was a massive reality check. "I've been through quite a lot, both personal life and football life. It's made me the man I am today, I wouldn't change much from what I've done in the past."